If you follow my blog, you will know about Parkamaya. Yes, they finally launched on Wednesday which is 12 Dec 2012. What a great date! During their opening day, they giveaway 1000 tote bags and you can also stand a chance to win RM50 voucher. Besides that, you can also stand a chance to win a brand new iPhone 5. That's not all! We have another 8 units of iPhone 5 to be won from 13.12.12 – 31.12.12. So much surprise right? If you miss the opening day. It’s okay! 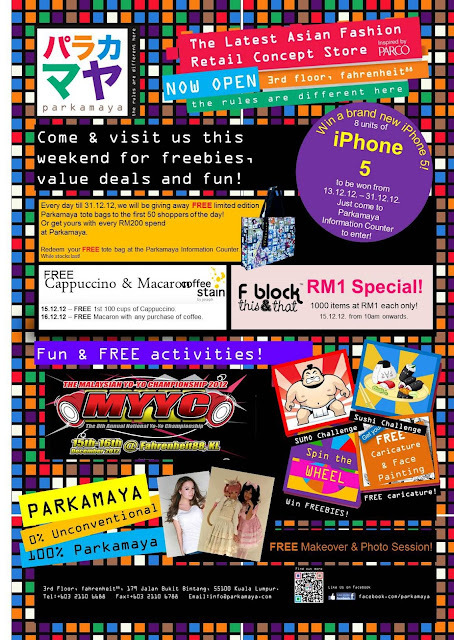 There are lots more happening at Parkamaya on this weekend (15-16 December 2012)! You still can stand a chance to win the brand new iPhone 5 and the first 50 customer can get free exclusive tote bags, freebie and lots more. AND there are also have some activities like Sushi eating, Sumo-wrestling, Caricature, and Face painting. There are all for FREE! AND AND AND 1000pcs items to be offer at RM1, only at f block, Parkamaya! Promotion will be start at 10am. Cool right? You think that’s all for that! You are wrong! You also can get a FREE makeover and photo session at Parkamaya! Besides that, there are also FREE coffee and macaroons at Coffee Stain. Lots are happening at Parkamaya! So, what are you waiting for? In Parkamaya, nothing is conventional and mainstream rules just don’t apply. Visit them now at Fahrenheit88 3rd floor! The rules are different here! Are you game enough to hang out there? Visit Parkamaya’s Fans Page for more updates.